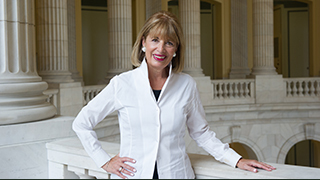 Jackie Speier (pronounced SPEAR) represents California’s 14th Congressional District, which stretches from the southern portion of San Francisco through San Mateo County to East Palo Alto. She is a recognized champion of women’s rights, privacy, and consumer safety—as well as an avowed opponent of government inefficiency and waste. In 2012, she was named to Newsweek’s list of 150 “Fearless Women” in the world.